At 94, Urban Rahoi is still flying airplanes, and he doesn’t plan to quit anytime soon. Rahoi’s latest exploit is piloting a P-51 Mustang, a World War II fighter plane he never had the chance to fly while serving as an Army Air Corps pilot during the war. Never one to pass up an opportunity, Rahoi traveled to Stallion 51 Flight Operations in Kissimmee, Fla., earlier this month to pilot one of the aviation company’s modified P-51 Mustangs. Co-piloting the fighter-bomber with Rahoi was John Posson, a former Wien Air Alaska pilot. 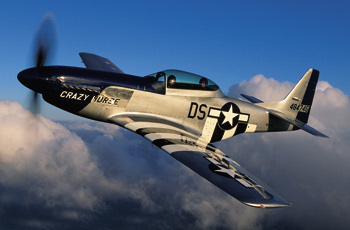 Rahoi learned about Stallion 51 and its vintage planes on a TV program a few months ago, and made an appointment to take up a P-51. Originally a single seater, the fighter plane has been modified into a two-seater with dual controls. For the complete story by Mary Beth Smetzer of the (Fairbanks, Alaska) Daily News-Miner, click here.